GoodReads: After spending the summer away from each other, Titus and Iolanthe (still disguised as Archer Fairfax) are eager to return to Eton College to resume their training to fight the Bane. Although no longer bound to Titus by a blood oath, Iolanthe is more committed than ever to fulfilling her destiny—especially with the agents of Atlantis quickly closing in. "What can I say?" she said, her voice growing fainter. "This damsel loves rescuing princes in distress." 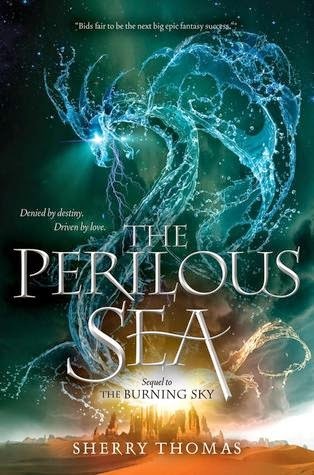 The Perilous Sea was an amazing sequel, and I'm not even surprised. To say that I loved The Burning Sky would be an understatement. Ever since I finished reading it I've been eagerly anticipating the release of the sequel, a sequel I just knew would deliver. Which, of course, it did. Oh yes, no middle book syndrome here, this is a solid sequel that is every bit as good as the first book. The Perilous Sea alternates between Titus's and Iolanthe's POV in the present and seven weeks in the future. This created a sense of intrigue as I was constantly wondering how they got to that point in the future. Plus, it didn't take too long to get back into the story. I remember being only 20% into the book and thinking wow I'm even not that far in and already there's swoons and a shocking twist. The unpredictable twists, continued on one after another and oh my gosh I loved it. Just as I came to a conclusion about something I was proved wrong. Every chapter ended on such a note that I just had to continue on to find out what happens next. The phrase I'm sure us bookworms are accustomed to thinking "just one more chapter" definitely applies to this book. Furthermore, The Perilous Sea also provides us with answers to some burning questions. From learning the truth about Iolanthe's past to finding out more about Titus's mothers vision. Both Titus and Iolanthe are likable characters with strengths and flaws. I loved that Titus wasn't afraid to admit when Iolanthe was better at something than he was. Further to this I liked the sense of equality between them, it wasn't just Titus saving/supporting Iolanthe, nope, she also did the saving/supporting. It just shows that they're both capable and strong characters. The romance was also wonderfully done, Thomas threw obstacles their way without bringing in a dreaded love triangle. One of my favourite things about this romance is the banter. It makes me smile, and adore these two characters even more. If there ever were two people who could be called ship worthy it would be them. So glad this lived up to your expectations! I wasn't a huge fan of The Burning Sky, but I think part of that is because I maybe wasn't in the right mood to read that kind of book or I was in a reading funk or SOMETHING because this kind of book would usually be right up my alley! And I'm a very mood-influenced reader so it's likely. Reading your review for the sequel and seeing your enthusiasm for the series definitely makes me want to give it another go!! I'm always impressed when the sequel is strong because that doesn't always happen in series these days, unfortunately. Yup, perhaps I'll have to reread the first one so that I can get to this one! ooh there is so much praise for this series and I must get to book one like ASAP. I am so glad that book 2 was just as brilliant. I still haven't read book one even if it's sitting on my Kindle library, but hearing that the second book does deliver and doesn't suffer from middle book syndrome is fantastic! Also I love that quote! Thanks for the review, Renu! I still haven't started this series so it's good to hear that the sequel isn't a letdown. The romance sounds cute and it's nice that you felt there was a sense of equality between Iolanthe and Titus. I have both of these books for review and I am glad that I put off reading this first one. So happy to see that five stars up there. I am anxious to get lost in this one and see how I like it. I FINALLY read The Burning Sky and now I'm itching to get my hands on this! I've heard great things - although I am scared because I've read they go through quite a bit plus tons of twists and turns. Happy to see that the sequel didn't disappoint you. Great review, Renu! I really need to go back to the first book. I had it but the shaky and rocky beginning really threw me off guard. I had to put it aside and haven't come back to it ever since but guuuh I want to feel the feels you had in the second book! Yup, a reread is in order, definitely. I haven't thought a lot about this book before, but after reading your review, I'm definitely going to have to add it to my list of books to be read! Also, that cover is gorgeous! Thank you so much for a fantastic review.